The Splatters Learn Some Manners is a cute book, told in rhyme, which discusses the importance of manners to young children. The Splatters are a very messy family. They are " . . . disheveled, uncouth. So vulgar and sloppy, it's just the sad truth!" The parents are undisciplined in the art of clean living and therefore, so are the children. Even the dog is dirty! Then one day the family receives a letter from the Duchess of their kingdom. "You Splatters," she writes, "my subjects, I hear it is told, your children run wild, your house smells of mold." In an effort to movitate them to clean up and learn some decent manners, she invites them out to a special dinner at a "Fancy Cafe!" But before they are allowed to accept the invitation and join her for dinner, they must first clean their house, themselves, and practice some table manners. As an introdution to this book, author Marty Mokler Banks explains that "manners are crazy things" and differ according to culture. She wrote this book not as a specific guideline for how All Children Must Behave but more as a "fun romp." She hopes that children will enjoy the rhyme, enjoy the story with accompanying illustrations and if they happen to learn a manner or two from the reading of this book - so much the better! All in all, this is quite a cute book. 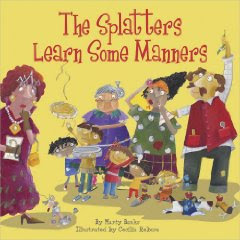 The Splatters Learn Some Manners is published by Harvest House Publishers. This just so happens to be the same company who published Socially Smart in 60 Seconds which I reviewed over at 5 Minutes for Books. You can read my review of Social Smart and Protocol Matters : Cultivating Social Graces in Christian Homes and Schools over at 5 Minutes for Books today. Both Harvest House and Canon Press offered a giveaway of these adult-oriented books on manners so hop on over, read my review, and leave a comment for a chance to win! As a note - I don't always link up my giveaway posts at 5 Minutes for Books here at Reading to Know. But every so often there is a book or set of books that I'm particularly excited about and this is one of those times. I heartily encourage you to check these books on manners out. It's worth some reading time. For additional children's books on manners, you can read my review of What Do You Say, Dear?/What Do You Do, Dear? by clicking on the title link. Sounds cute. I have to admit, I'm a sucker for cute rhyming books.